I love LEDs. I have an awesome super-bright Inova X03 LED flashlight. If a piece of electronic equipment has a blue LED, I want it. And soon, LEDs will be great for general-purpose lighting, too. They’re a bit on the expensive side right now, but that will change. LED bulbs use less energy and last longer than incandescent bulbs and CFLs. That’s right, if you have an LED bulb, you can totally one-up those CFL users. It’s like pulling up next to a smug Prius driver in a Tesla or on a bicycle. Or telling a vegetarian that you can’t eat her cookies because you’re a vegan. The bulbs I got are supposed to last more than ten years. I tried to test this claim tonight, but it was taking too long, so I’ll take their word for it. But I must give incandescent bulbs some credit when it comes to longevity. There’s one that’s been burning for over 100 years less than an hour away. I don’t even think California was a state 100 years ago. I’ll definitely have to check it out if I’m ever up that way. I was eager to install my LED bulbs when I got back to my apartment tonight, and here’s what I found. I don’t use 40 W incandescent (or CFL equivalent) bulbs anywhere in my apartment. 40 watts is dim. 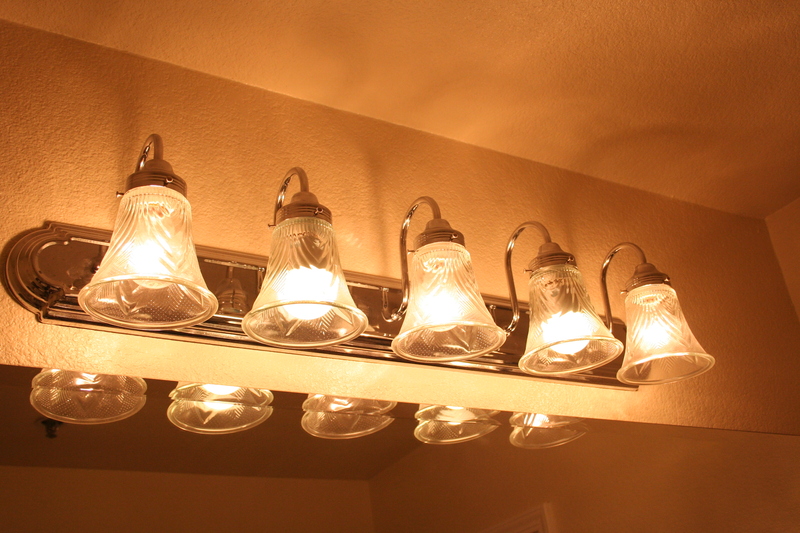 I use CFLs in my kitchen and living room (they use 23 watts and are very bright), but in my bathroom I have a row of five 60-watt incandescent bulbs above my mirror. What I did was replace two of the bulbs with my LEDs, which use five watts each. Now my bathroom lighting energy usage is 63% of what it used to be, while maintaining 87% of the brightness. That’s pretty good, and I can’t notice the difference. I actually remember when they were building our house in Pennsylvania that they set any dim-able lights at 90% by default, because nobody will notice the difference in brightness, but it makes the bulbs last about twice as long. Can you spot the LED bulbs in the picture above? Counting from left to right, they’re in positions 2 and 4 (or 1 and 3 if you’re a programmer). A bit softer than the clear incandescent bulbs they’re next to, but you really have to look to notice the difference. 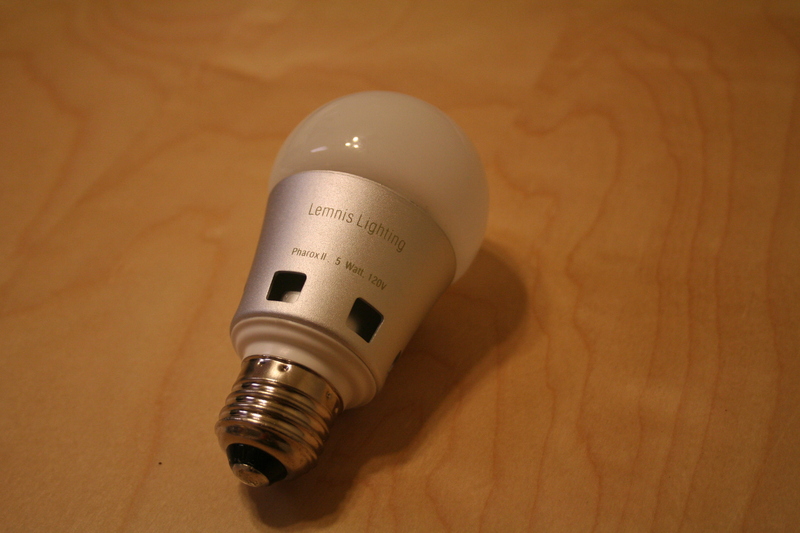 The color of the light is about the same as a standard warm incandescent, and a quirky thing is that it takes about a half second to turn on after receiving power. However, they do come on at full brightness, unlike my CFLs which turn on a bit dim and gradually reach full brightness over about a minute. 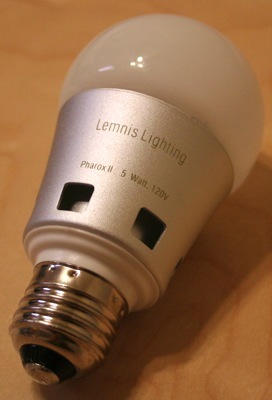 The glass does not get hot, but like CFLs, the base of the bulb still does. I’m hopeful that by the time I have my own place, LED bulbs will be inexpensive and bright enough to light my entire house. * There’s actually a somewhat embarrassing parenthetical remark that I’ll paste right here: “(both as regular bulbs and fun modern accents – esp. blue).” I’m kind of a lighting geek. This is why I need to get married before I get rich. If those events occur out of order, my house will look like a cross between a sci-fi spaceship set and a nightclub. It hit the minimum population requirements for Statehood because of the gold rush. It was also the southernmost State to stay in the Union during the Civil War. The only States that weren’t in the union 100 years ago were New Mexico, Arizona, Alaska, and Hawaii. I meant for my “California wasn’t even a state” line to be a joke, like when I pretend to think that Alaska and Hawaii are the 51st and 52nd states. When I wrote that, I thought, “There can’t be any state that wasn’t around 100 years ago! But it looks like the joke’s on me, because Bergy has pointed out my assumption was wrong.